There is something so nice about a handwritten note - either sending one or receiving one. Sent-Well is such a fun & unique idea, and perfect for those of us who like sending cards but can't always find the time. Simply pick a card and they'll handwrite your message & send it off! 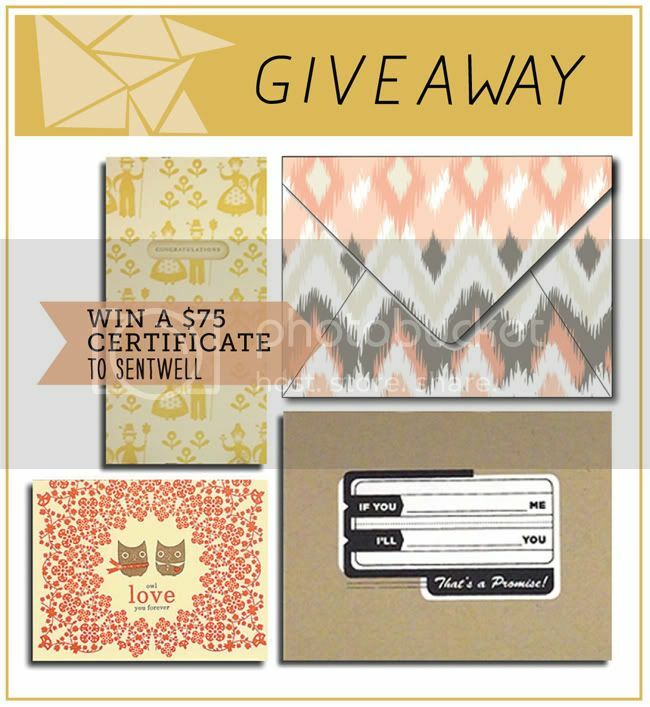 Enter to win $75 gift certificate from Sent-Well today! We're trying out giveawaytools.com this time - please let me know if there are any issues. I love the "Will You Be My Bridesmaid?" cards! I love the "yikes you're old" and pirate birthday cards! A hand written note means so much! I would love to have more cards in my stash! I love all the patterned envelopes. Especially the ikat one. I love the idea and the cards are beautiful. I liked the thank you box sets. My favorite are all the birthday cards! I love the letters from Santa and the scratch-n-sniff cards are hilarious! I love the dog friendly section! The "Be My Honey" card is adorable! I love the Woodland Notecards! So awesomely cute! I LOVE the "I love you a latte" cards. Adorable! I love the Fruits & Vegs note card set! I love the 'We have a new nest' Address change cards! I love the adorable watermelon spitting out the seeds to spell 'hi.' It's called the Summer Hello! This idea is AMAZING! One step further than e-card service, Sent Well really makes it simple to send genuine beautiful cards to people. I really love the sea of whales card! Reminds me of native art from the Pacific northwest. The Boy meets girl card is adorable! how they chose to print it on wood! I think the candy thank you cards are darling. Love their Thank You notes! They have a lovely selection of cards! Love the BD52 Girl Birthday Red card from Bella and Boo. Cards are very beautiful ! Especially "I love you owlways", sooo cute ! I love the cute little watermelon card! I love the exotic birds stationary! I loooove writing people handwritten letters! I wish I still had a penpal! octopus + sucker for you <3 cute! I really think sending a handwritten note is the best way to say "thank you". I always have a box of blank notes on my desk. Love this idea, when you want to send a bunch, like thank yous after a wedding or something! The bun in the oven design is too cute. I love the "here comes the bride" card! It'd be so perfect for my friend's upcoming wedding, especially paired with the "always" necklace--I love that they do the sets together! i love the birthday cards! omg I love the owl love you forever one! I really like the Be My Honey card. So cute~! the summer hello card is adorable - will brighten a cold dreary winter! I love the 'If I was a zombie, I'd eat your brains passionately' card! It made me laugh so hard. love hand written notes. It seems like they're such a forgotten item but I love receive them every once in a while! or every day! I am loving that Kraft Envelope with the fun label on it! I would love to use it to send fun notes to my wedding clients! Love the simple save-the-dates. And the card about calling God and saying "Dude WTF" captures such a perfect sentiment. Hello! I was looking to see if anyone was interested in doing a lovely package exchange with me. I am a big fan of the exchanges Danni holds, yet I missed signing up for the upcoming one. Maybe you did too? We would go by Danni's guidelines and deadlines but just organize it ourselves. If you are interested email me at amanda0424@optonline.net and we can exchange information. I totally believe in hand written notes! The Summer Hello card is cute and quirky! As an animal lover I really liked the Jungle Babies card and that you can add unique envelopes! the summer hello card is so adorable! I adore the Owl Love You Forever card :) Thank you for this giveaway! My grandmother taught me the importance of handwritten notes :) they are all beautiful! Cute cards! Lots of different styles for different tastes. I would love a business card to promote my website! So many cute ones! I love the "stud" one with the horse. Hilarious. I love the blank foxy friend cards. I love all the graphics! The Couple Conrats cards are the cutest! I love the mustard hue and the sweet little dutch couple!